Ride-sharing giant Uber has recently rolled out a loyalty program called Uber Rewards. Uber Rewards incentivizes to spend more money on the app. Uber will reward you one point for every dollar that is spent on Uber Pool rides and Uber Eats orders. And you will receive two points for ordering an UberX, UberXL, Uber Select, or Uber WAV. Three points are awarded for Uber Black and Uber Black SUV rides. 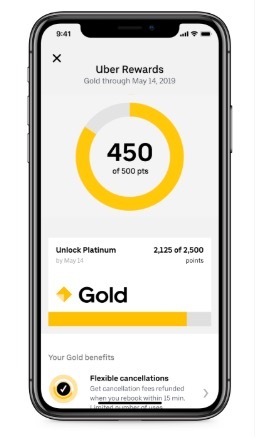 There are several status levels, including Blue (0-500 points), Gold (500-2,500 points), Platinum (2,500-7,500 points), and Diamond (7,500+ points). When you hit a certain point milestone, then you will have that status level for the next six months. And whenever you hit the next point level, you unlock that status. For the first 500 points, you will gain $5 to spend at Uber. The Gold level includes free cancellations within 15 minutes and it also has priority customer support. Platinum level includes the lower tier benefits along with price locking between two places on UberX rides and priority pick-ups at airports. Diamond includes the lower tiers along with dedicated phone support, free Uber Black upgrades, access to highly rated drivers, and no delivery fee on three Uber Eats orders every six months. Uber Rewards is available in Miami, New Jersey, Denver, Tampa, New York, Washington, DC, Philadelphia, Atlanta, and San Diego now. And Uber said it will roll out to all US drivers in the next few months. If you live in one of these areas, then you can sign up for the wait list now.